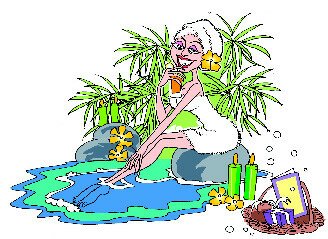 Sheela Mahajan, a resident of Sector 46, has decided to celebrate this New Year’s Eve at a Spa Party. “This Party is open to women only – though they can bring their kids. They just have to pay Rs. 1,500 and we will provide them unlimited wine and food, and some much-needed pampering – courtesy the best Spa Therapists in the City,” informs Sheela. She feels that most women have to work almost 24x7 (office and/or home), and most deservedly need to treat themselves on this special day. Comfort Food - such as popcorn, pizzas, hot chocolate and some health drinks – will be on offer. There will be genuine games to be played - such as ‘twister’…and of course Cards. Special activities and a Kiddie Spa have been arranged for the children. “The Dress Code is ‘Pyjamas’! There is no need to spend money on something glitzy,” smiles Swati, who has already registered for the Party. “We have been party animals from our college days. However, now the music does get to you…and a special outing in this City is also not cheap. On New Year’s Eve we usually watch a movie or celebrate with a cake-cutting at home. This time I think the Spa Party promises something unique – it appeals to me,” she says. Celebrate New Year in Paris! Nikhat, 29, never goes out on New Year’s Eve, as her kids are small and it is hard for her to keep them awake for the midnight festivities. But this time she has found an answer. She can celebrate this Eve at the same time that people in Paris will be celebrating (which will be early morning in India). It is a ‘Celebrate in Paris’ bash, being thrown by Sukhdeep Chawla at the Country Inn. Sukhdeep, who moved from Canada to the City last year, says, “This concept is quite popular in the US and Canada. Many Gurgaonites can’t celebrate the New Year at midnight, and so we provide them an option to celebrate with the people of other countries!” The Party Hall will have LEDs on all the walls, where a ‘live’ coverage of the New Year’s Eve celebrations in Paris will be shown. Sukhdeep is also offering ‘Celebrate in Sydney’, for those who want to celebrate an early New Year in India. To make it more interesting, Italian food will be served in the ‘Celebrate in Paris’ celebrations, while Continental delicacies will be offered at the ‘Celebrate in Sydney’ bash. The entry is Rs. 2,000 per couple. For many, simply celebrating in a Church or Temple is the best way to welcome 2014. Shikha Ahuja, 21, is not very religious, but she prefers to spend her New Year’s Eve in a church, where she enjoys the last prayer of the year. “There can nothing be better than trying to attain peace, at the start of a New Year. I feel great when the clock strikes midnight and the whole gathering starts reciting prayers. There is no noise, no alcohol and no nuisance. It gives you immense peace,” feels Shikha. Silently observing an early morning ‘Diya Procession’ at the Khatu Shyam Temple in ‘old’ Gurgaon is an interesting experience. Every year, many devotees assemble and take out a Procession with ‘Diyas’ in their hands. “A Khatu Shyam Mandir is located at only three places in the country – and one of them is in Gurgaon. However, few people in the City seem to be aware of it. Although the Hindu New Year differs from that of the West, we organize a small Procession every January 1 (early morning), to make people aware of the Temple, as well as the causes that we work for - such as ‘Gau Seva’,” informs Pt. Karamibuja, the Priest. The Ice-skating Rinks in the City are the perfect ‘winter locations’ to celebrate New Year’s Eve. The Ice-skating Rink at the Ambience Mall is arranging a special Ice-skating Party for couples. “We will provide special overcoats and waterproof socks and gloves for the elderly; and will serve sugar-free delicacies and hot chocolate to all couples. We believe that an Ice-skating Party can be an active and exhilarating experience – especially for couples. A partner may also choose to ‘chill’ outside the Rink and enjoy the good music,” says Jayant, the Manager. They are also holding separate parties for Kids. A ticket for a couple starts from Rs. 2,500. FG wishes all Gurgaonites a Happy New Year!